Keeping your signals removable is an interesting option from the viewpoint of maintenance and care for a portable layout. The risk of damage is largest during set-up and breaking-down when the layouts are out of their transport boxes but not in a stable layout set-up. The average signal represents a huge time investment which make them into the most precious and at the same time most damage prone objects. They are easily knocked over and generally all work is lost when the mast is damaged. Getting them out of the way in dangerous periods makes thus some sense. It is however not obvious how to make them removable and still obtain reliable operation at the same time. My first trials used simple friction but I found it not reliable enough as there was a tendency that they moved when operated. Instead of taking refuge to fixing them with screws or glue I have found another solution that is far neater. However this was not after exploring option 1. Option 1 : integrating the drive such that the signal will not move when operated. Option 2 : find a better fixing method. Actually I followed both paths. I had extensive trials with memory wire but was never really satisfied. Making the electric connections involved plugging a connector and producing the constant current requires a small electronic circuit. The large current and low voltage are a major drawback meaning another heavy transformer to carry with. All in all the costs of these components make it just as expensive as a standard motor drive, thus 'forget-me-wire' again. However there turned out to be a simple solution for option 2, only it took rather long to register. I tend to pick things at shows that may come to hand when time is there without having a notion what to do with it at time of buying. But it was as simple as that, there was a large set of small magnets lying within vision just waiting to be used. Changing the brass plate for a steel one and fixing the magnets to the baseboard was all that was required. The magnets in question are 5 mm diameter and 2 mm thick and modern material. They are very strong, they easily jump over a distance of 3 cm under their own attractive forces. 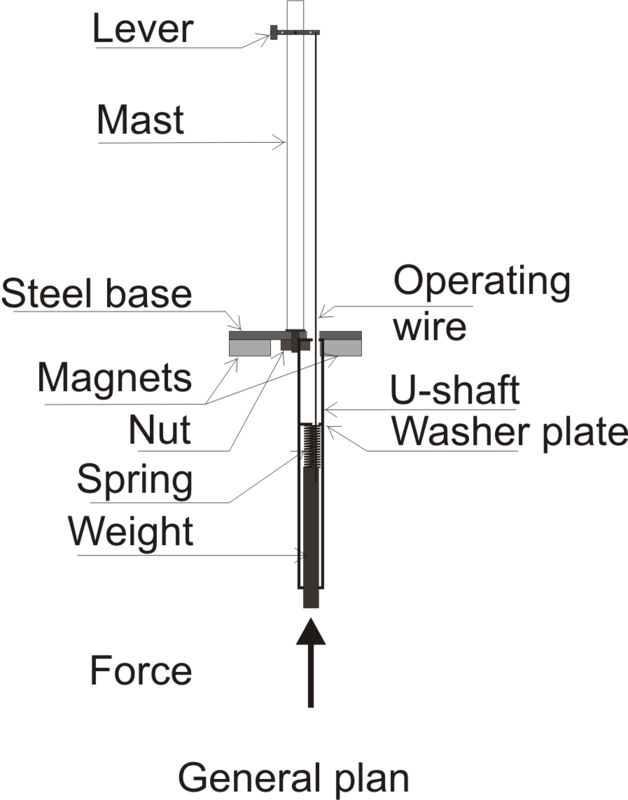 In fact the force of 1 magnet would easily suffice if they could be fixed centrally in relation to the forces. (Meaning that if you can find magnets with a small hole only a single one would suffice). The signals in question are Weinert kits, which I can no longer recommend as they take a ridiculous amount of time to put together. In the vicinity of 10 hours a piece and that even in batch building mode. They are true to scale but the newer Viesmann ready to use ones are not only cheaper but also cost only single hour to refine into a representation that is as good as the Weinert and they include lighting too. But coming to the point, the drawing gives the details on how I made the basic mechanism. We start with cutting a new base plate for the signal from steel strip. I used some obsolete N weighting plate of 1 mm thick. The dimensions I used were 8 mm wide by 16 m long. I drilled two 2mm holes in it, one for the operating wire and another for fixing the mast. The signal base has an M 2 thread. The operating wire that comes from the lever is only 0.2 mm PB in my case thus can easily do with a smaller hole. In order to move the arm the wire needs either to be pulled or pushed. Hopefully you will agree that pushing is far easier as pulling, but for those who think different go ahead, it is possible. If we use a weight then gravity can do the down direction. However as unbeliever I am not convinced that this is a reliable option, therefor I decided to add an N-gauge coupling spring. This ensures that the signal always has a stable position even when not in use and that we only have to push to operate it. Ideally from railway operation viewpoint this should be the stop position but actually it is the safe position. But this may depend on your signal of course. Now with this weight sticking out on a 0.2 mm wire this would easily damage when away from the baseboard. Thus we need some shaft as protection. However as we also need to fix the wire to the weight it will be bit awkward when it is closed on all sides. Therefor I used a piece of 4 mm brass U-profile of 30 mm length. This U-profile is directly soldered to the steel base plate but it needs a small cut-out to be able to turn the nut when we mount the mast. The weight is partly drilled in the center and partly under 45 degrees thus we can thread the operating wire through it. Also I reduced the diameter from 3mm to about 2.7 to enable free movement. A small saw cut and a square washer enables us to mount the spring a bit further downwards. When everything is threaded together and the wire adjusted to length then the hole in the weight is filled with solder. Finally but not shown in the drawing or photos I put a brass envelope around the U-shaft folded from scrap brass. Now the weight is fully enclosed and nothing can happen. This envelope can also be a piece of plastic tube (shrinking tube) or some tape of course. Mounting the whole lot means drilling a hole of about 6 mm into the base plate. At the top this is widened to the dimension of the base plate and to depth of 3 mm for magnet and base plate. I mounted the magnets on 2 steel pins in the base board with some super glue. This opens an extra option to have a lighted signal (2 colours per wire using smd leds, min. 2 wires) if we isolate the base from the magnets with a thin piece of pcb. The 0.2 mm pcb variant seems excellent for this. The pins can be connected from the under side of the baseboard and on the mast the wires end at the under side of the pcb. 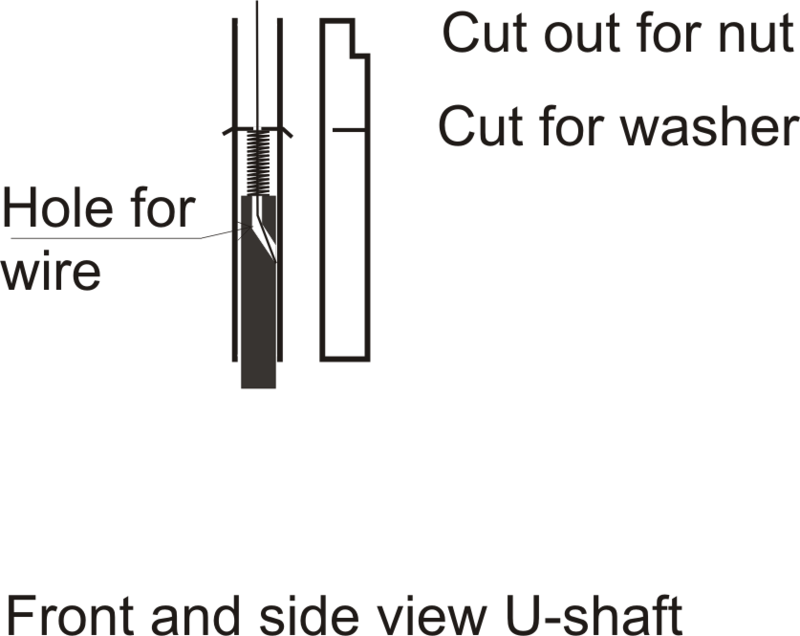 The shaft can be used as third contact with a bronze contact finger. The area around the magnets was later filled with lazy man's filler. This just concerns topping up the area around the magnets with fine sand that nicely fills all gaps (quartz or fuse sand will do the job eminently) and dripping super glue into it. This hardens to rock and is much faster than epoxy or other stuff. Operating the attraption is easy. I mounted a Hoffman point motor at the under side of the baseboard which operates a lever mechanism that with a spoonlike top end pushes against the weight. The point motor has 2 stable positions and end switches thus draws no current when not in use. There is also a feedback contact available for some dcc input. Now that leaves us that main question for a risk analysis: Is the chance that I now damage all signals in one go during transport smaller than having them not removable and damaging them 1 by 1? Any takers?